Matt Hayden, charter school chef, serves up some tasty racoon at the Wild Food Challenge held at the Farm Institute. Martha’s Vineyard Public Charter School chef and Wilderness Survival School instructor Matt Hayden hears crickets in his kitchen. That’s because the crunchy, six-legged critters are actually part of his meal. 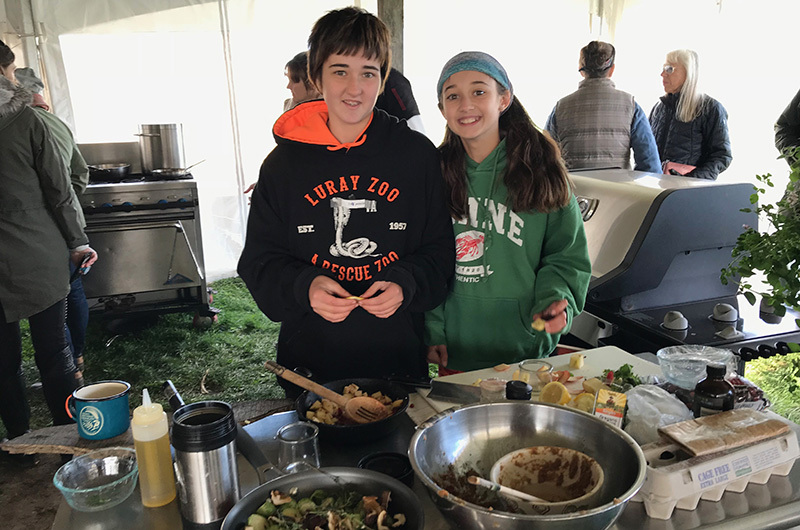 On Sunday afternoon, the arthropods, along with mealworms, freshwater eels, deer-stuffed rabbits, rabbit-stuffed squirrels, oddly hollow raccoons, boar, bluefish and more were all free for the sampling at Mr. Hayden’s booth at the Wild Food Challenge held at the Farm Institute. The only price was being brave enough to try. 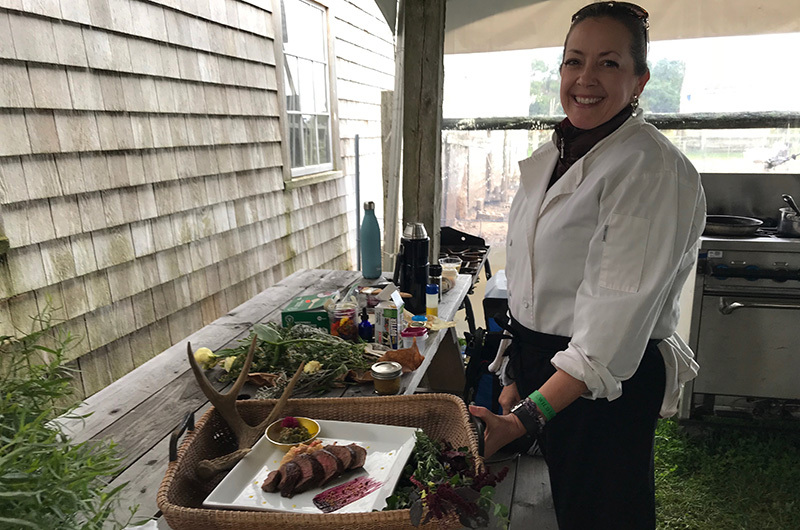 Sunday marked the eighth annual Wild Food Challenge on Martha’s Vineyard. 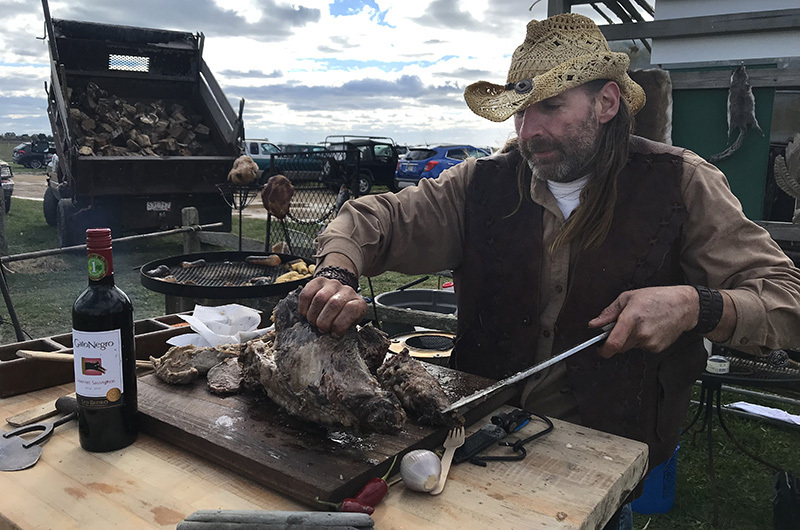 The competition is organized by Bill Manson, a New Zealander who has organized Wild Food Challenges in his home country and around the world. He first came to the Island as a private chef, and upon encountering the vibrant cooking community and bounteous natural resources here, he decided to bring his competition with him. For Mr. Manson, the main purpose of the competition isn’t to find out who can roast the best raccoon or crisp the best cricket; it’s to teach people that sometimes the tastiest food doesn’t have to come from a grocery store. “The whole concept behind this wild food is about making use of what people see in their everyday lives, and to be resourceful with them,” Mr. Manson said. Mr. Manson has traveled the world, from the Northern Italian Alps to the bayous of New Orleans, learning about different foraging practices. Competitors on the Vineyard didn’t disappoint either. Real estate broker and trained-chef Leslie Floyd cooked up a tenderloin of pan-seared venison with a blueberry gastrique, made from foraged fruit, vinegar and sugar. Vanessa M. Sabee citrus-brined a whole chicken from Morning Glory Farm, serving it with fall squashes and other tasty autumn veggies. Although venison was unquestionably the most popular protein, Tom Barrett went for something a little more fibrous. 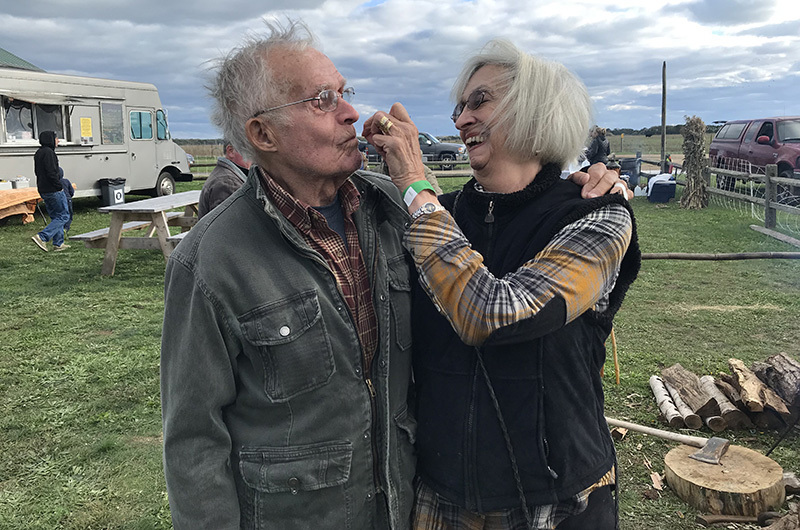 “I’m gonna try a mealworm,” he told his wife Ann. After Mr. Barrett popped one of the balsamic-reduced crawlers into his mouth, his eyes lit up with excitement. “I feel better already,” he said. Next in line were the crickets, bouncing around in a jar filled with oatmeal. “I’m purging them,” Matt Hayden said. He’s kept the crickets in the jar for a week, limiting their diet to oats so that people could eat them raw. Suffice to say, the venison was more popular. Last year’s winner, Doug Werther, an Oak Bluffs carpenter who has also worked in restaurants more as a waiter than a chef, cooked up oven-roasted Island venison and “Senge scallops” with a sweetcorn puree and lobster reduction. The venison bug bit others hard as well. 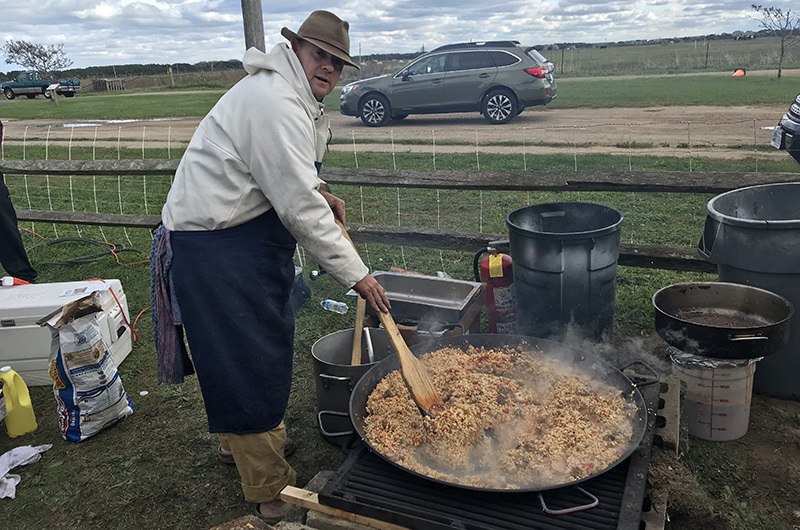 Hunter Joe Capece gave deer carving and skinning lessons to a rapt audience while his daughters, Koko and Lucia, made autumn olive cookies and applesauce. The “deer family,” as Mr. Manson called them, took home Best Story of the evening. Brother and sister duo John and Sarah Thurgood made kelp pasta with assorted vegetables and sea creatures. Their efforts were rewarded. Sarah Thurgood took home Best from the Land. Her brother earned Best from the Sea. The prize for the junior division went to Eli Aronie, age 8, who made acorn-flour crusted venison. Acorn flour is something even full-time chefs are scared to cook. By the time Eli finished explaining, Everett Whiting had already taken home the grand prize. What did he cook? Venison, three ways. After the awards, the festivities continued in classic Vineyard fashion, with music from Johnny Hoy and the (locally sourced) Bluefish.